Sang-moon Bae was able to overcome a one-shot deficit going into Sunday’s final round to win his first PGA Tour event at the HP Byron Nelson Championship. 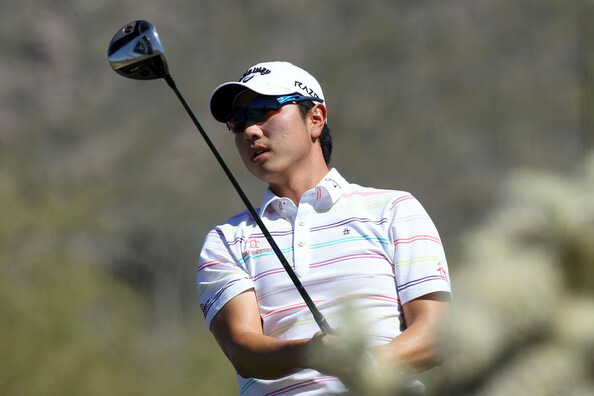 It was back and forth all day between Sang-Moon Bae and Keegan Bradley, with Bae actually holding a four-shot lead at one point, but Bradley managed to get it back to level par as the pair approached the par-5 16th. Both players pitched on to the green and had putts from the same side of the hole. While Bae managed to knock his in from about six feet, Bradley missed from inside of that, giving Bae a one-shot lead into 17. After a poor tee shot, Bradley lost another shot to Bae, and when both players made par on the final hole, Bae had his first PGA Tour win. We’ve seen this in recent weeks with guys like John Merrick and Derek Ernst, but the big thing for a guy like Bae, even though his pedigree is more seasoned than those two, is that he’s now exempt for two years on the PGA Tour. Bae joins other first time winners of this tournament Jason Day and Keegan Bradley, both of whom are considered two of the best players in the world. He’s got 12 wins as a professional, but there are none bigger than this. After hearing about the passing of Ken Venturi on Friday night, I was going to write this as an individual post, but I didn’t feel like I had experienced enough of his career to accurately comment on it in an expanded post. What I remember about Venturi is the tail end of his broadcast career, playing the role of colour man to Jim Nantz on CBS, and he always seemed like a voice of comfort and reason, especially when compared to the louder and more boisterous Johnny Miller on NBC. His detractors would say that he wasn’t critical enough, but he chose to use his words a little more carefully than others, something which probably endeared himself to the players more than other broadcasters. Of course, Venturi was an accomplished player as well, most famous for winning the 1964 U.S. Open while battling a serious case of dehydration, along with thirteen other PGA Tour wins before having to retire in 1966 due to a chronic bout of carpal tunnel syndrome in both wrists. Venturi was finally inducted into the World Golf Hall of Fame a couple of weeks ago, but was unable to make the ceremony due to his illness. It’s rare in the sports world today to see someone who was both universally respected and liked, but that was exactly the way it was with Venturi. It was especially touching to hear Nantz sign off on Saturday with “Goodnight everyone. Goodnight Ken.” He’ll definitely be missed. 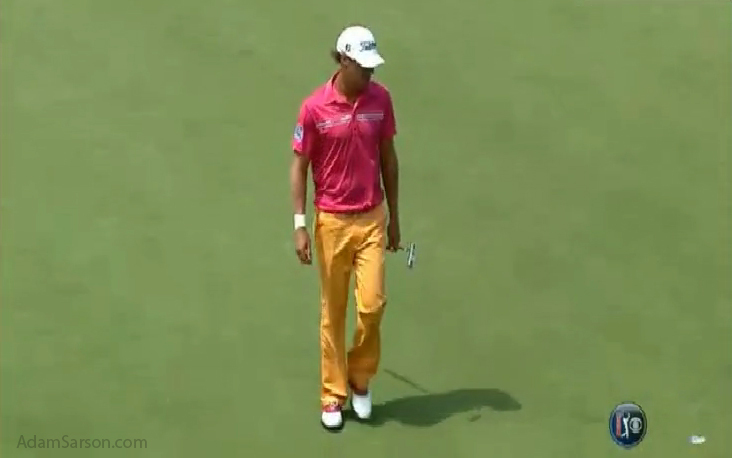 Not sure what Graham DeLaet was thinking on Saturday with this ensemble, which CBS’ Nick Faldo said made DeLaet look like a cupcake. Notables to miss the cut: Jeff Maggert, Brian Davis, Y.E. Yang, Brian Gay, Greg Chalmers, Ken Duke, Trevor Immelman, Tommy Gainey, John Senden, Robert Garrigus, Guan Tianlang and Boo Weekley. Louis Oosthuizen withdrew from the event this morning citing a neck injury. Tough way for Charl Schwartzel to finish in solo third considering all of the missed putts he had today. From what I saw, he missed birdie putts on 9, 10, 11, 12 and 15. Graeme McDowell defeated Thongchai Jaidee this morning in Bulgaria at the Volvo World Match Play Championship, giving him two pretty significant wins in 2013, as he won the RBC Heritage at Harbour Town a few weeks ago. Also in Europe, Peter Uihlein won the Madeira Islands Open in Portugal by two shots over Morten Orum Madsen and Mark Tullo. It’s been a long time coming for Uihlein, the American who won the 2010 U.S. Amateur and was the number one ranked amateur in the world, but decided to take the non-traditional route to his professional career, eschewing the American tours for a chance to play in Europe. He’s had a decent year so far, with six top-25 finishes worldwide, but this is his biggest tournament to date, and it gets him an 18 month exemption on the European Tour.